This blog post is part of The Dubsado Blueprint: a free download to help you build out Dubsado like a pro. You can grab the sep-by-step guide here. 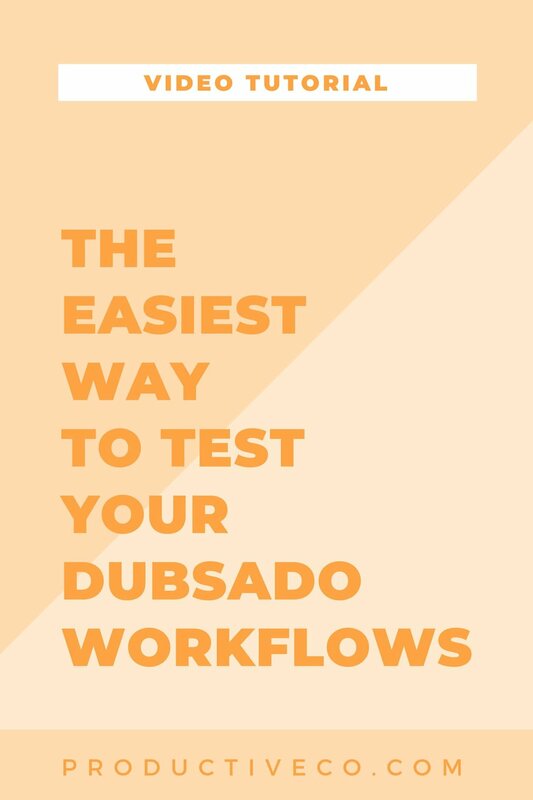 Before you put your Dubsado account out into the world, you’ll want to make sure that there are no kinks in your workflow. Depending on how you’ve assembled your workflow, there might be a bottleneck that brings your automation to a halt. And who wants a workflow that has no flow? If you are using Dubsado, you most likely want to enhance and automate parts of your client experience. You’re going to need a workflow that runs like a well-oiled machine. The best way to avoid this problem is to test out your workflows. After all, it’s better to work out any kinks before your prospective/current clients go through your system. In this case, you would go through every step of your workflow by yourself. This means you will have to act as the client and the service provider. You’ll need to send emails and forms to yourself, etc. This also means you will have to log in and log out of Dubsado several times in order to complete each step. Why, you ask? Because what your clients have access to is different from what you have access to. Furthermore, Dubsado has a slightly different view for clients than they do for service providers. For example, you will not see “submit” buttons when you are logged in as a service provider. Check out this quick video on how to view a proposal as a client. You can apply the same method in the video to all Dubsado forms! This is the method I recommend. Why? It’s more foolproof that the first method and you’ll be able to get feedback from someone who goes through the experience. Have a friend sit next to you with their laptop. They will act as the client while you act as yourself, the service provider. They’ll respond to your emails, fill out your forms, sign your contracts, etc. You’ll activate their client portals, send out emails and forms, countersign your contracts, track your time, create invoices, etc. You can even double check when they receive your emails and when they last look at them. See how to do that in the video below. Using this method means that you do not need to log in and out of Dubsado several times, like you do in the first method. While you are testing your workflows, make note of any hiccups, spelling errors, formatting issues, etc. Adjust your workflows accordingly, then rinse and repeat the process. Once you’ve got workflows that run exactly the way you want, take some time to celebrate your accomplishment. Dubsado is going to save you a lot of time, a lot of money (on software, opportunity costs, and payment processing fees), and is going to automate several parts of your client management. That is worth a celebration. What are you going to do with the time and money you save? Let me know in the comments below. This post may contain affiliate links, but I only refer products and services I can stand by. Read my disclosure for more info. Have you downloaded a free copy of The Dubsado Blueprint yet?